Bumble (yes, the app that you or at least ONE of your friends have tried) is coming to Toronto this weekend for an interactive and inspiring pop-up! With over 30 million users, Bumble has become known as a “female first” app that connects people through dating, friendships and professional networking. No matter the type of relationship, women always have to make the first move on Bumble. And now you can interact with the brand and watch their core values come to life during their first-ever Toronto pop-up. We’re stoked to check out interactive sessions with thought-leaders and entrepreneurs, including Erin Foster (Head of Creative, Bumble BFF and BIZZ), Maria Qamar (Hate Copy), Monica Heisey (SDTC, I Can’t Believe It’s Not Better), Dr. Jess Carbino (Bumble Sociologist, Relationship & Online Dating Expert) and Amy Wood (Drunk Feminist Films). See the full lineup and schedule here. Guests can look forward to drinks and snacks from Ace Hill Beer and Girl Gang Goodies, a photo station by Kastor and Pollux, a piercing station by Mejuri and a Bumble Bio Bar. Wanna come? Great! The event is FREE but make sure you have a Bumble Date, Bumble BFF, or Bumble Bizz profile to show at the door. 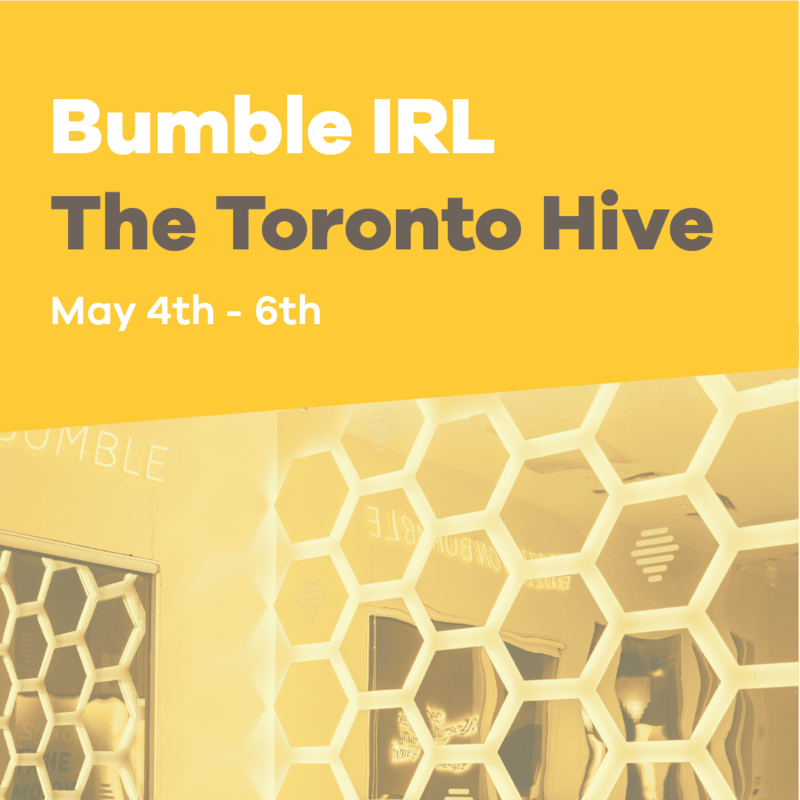 The Bumble Hive is coming to Toronto May 4-6 at 950 Queen St. West 10:00 a.m to 10:00 p.m. daily.